Acknowledged author N. Gregory Mankiw wrote Principles of Economics comprising 888 pages back in 2017. Textbook and etextbook are published under ISBN 1305585127 and 9781305585126. 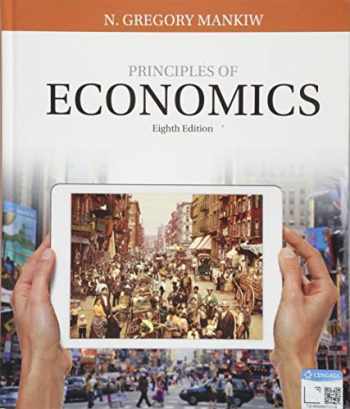 Since then Principles of Economics textbook received total rating of 4 stars and was available to sell back to BooksRun online for the top buyback price of $28.84 or rent at the marketplace. Now you can master the principles of economics with the help of the most popular, widely-used economics textbook by students worldwide -- Mankiw's PRINCIPLES OF ECONOMICS, 8E. With its clear and engaging writing style, this book emphasizes only the material that will help you better understand the world in which you live, will make you a more astute participant in the economy, and will give you a better understanding of both the potential and limits of economic policy. The latest relevant economic examples bring principles to life. Acclaimed text author N. Gregory Mankiw explains, "I have tried to put myself in the position of someone seeing economics for the first time. My goal is to emphasize the material that students should and do find interesting about the study of the economy." Powerful student-focused digital resources are available in leading MindTap and Aplia digital learning and homework solutions that reinforce the principles presented in this edition.